TOYCON Philippines organizer The Asian Comics, Toys and Hobbies Collective, Inc. has announced its first wave of guests for this year's event. 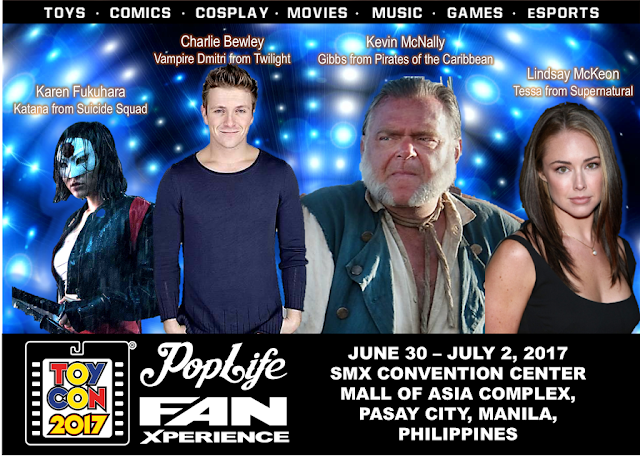 The first wave of guests include Karen Fukuhara (Suicide Squad), Charlie Bewley (The Twilight Saga, Renegades), Kevin McNalley (Pirates of the Caribbean, Assassin's Creed III) and Lindsey McKeon (Supernatural, NCIS, Drop Dead Diva, One Tree Hill). The TOYCON organizer advises everyone to "Watch out soon for the availability of meet and greet passes [...]"
The Philippine Toys, Hobbies and Collectibles Convention (TOYCON Philippines) 2017 - PopLife FanXperience will be held at the SMX Convention Center - Manila, Mall of Asia Complex, Pasay City from June 30 to July 2. One-day passes are priced at Php500 and will soon be available at SM Tickets outlets and online through www.smtickets.com. Ex-Link Events is the Event Manager for the 2017 Philippine Toys, Hobbies and Collectibles Convention (TOYCON Philippines). For sponsorships, call (+63 2) 633-0153, 643-3887, 535-1150; SMS (+63) 920 981 4376 or (+63) 920 924 2532; email info@exlinkevents.com or message us on Facebook at @exlinkevents.